Having a baby is hard guys! My husband and I were laughing about how everyone tells you its hard but somehow you don’t really believe them. I guess its because they all did it and mostly made it look pretty easy too! Its funny how differently things look from the outside. So, I’m prefacing this post which has nothing to do with babies, with an anecdote about babies because with the holidays on top of having a new baby, this is somehow the first post I’ve managed to get up since November! I truly didn’t think it’d be that way. But, I also thought I’d be in a solid workout regimen, whipping up all whole30-approved meals, and sleeping at least a solid 5 hour shift every night. Do I need to tell you that none of those things is happening right now? Really, I’m just doing my best to make it through January and keep my house in relative order. But I tried really hard to get this post up this week because I wanted it to be up before the end of January and we received requests throughout all 2016 about whether or not we’d be doing a 2017 version of our DIY Stendig calendar. Don’t wanna leave you all hanging! So here it is!! 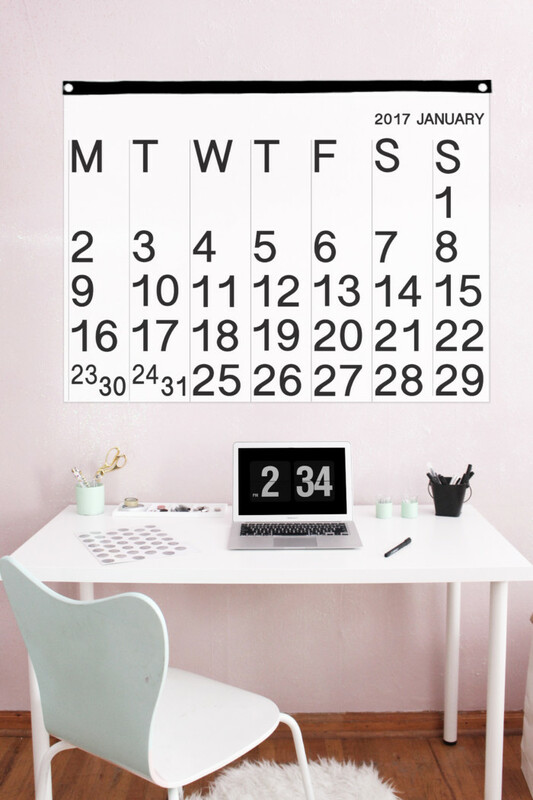 Last year I shared this printable and tutorial and I have loved my calendar so much! Its held up perfectly and adds just the right amount of minimal decor to a room. The reason I initially made my own was because I waited till the new year to buy one, which is too long! The original Stendig sells out every year, before January. The financial benefit to printing them yourself changes depending on when you’re trying to buy one. If you order them promptly, before the new year, its actually much cheaper to buy the real thing (about $45). However, as they sell out and resellers are in higher demand, the price slowly creeps up. Right now, the best I can find online with shipping is $70. In a month, it’ll be around $130. To print them yourself, at the same size (36″ x 48″) will run you about $90. And don’t forget it takes time to make it too (not a lot, but some, and time is worth money!). So right now, its worth it to buy them. Next month, its worth it to make them. Where I find these printables always beneficial is if you want a smaller version of the iconic calendar. Not everyone has room for a 4 foot long piece of artwork (and I definitely thing the Stendig qualifies as artwork). For example, last year I made one that was only 18″ x 24″ and it was perfect for my room. It also only cost $23. 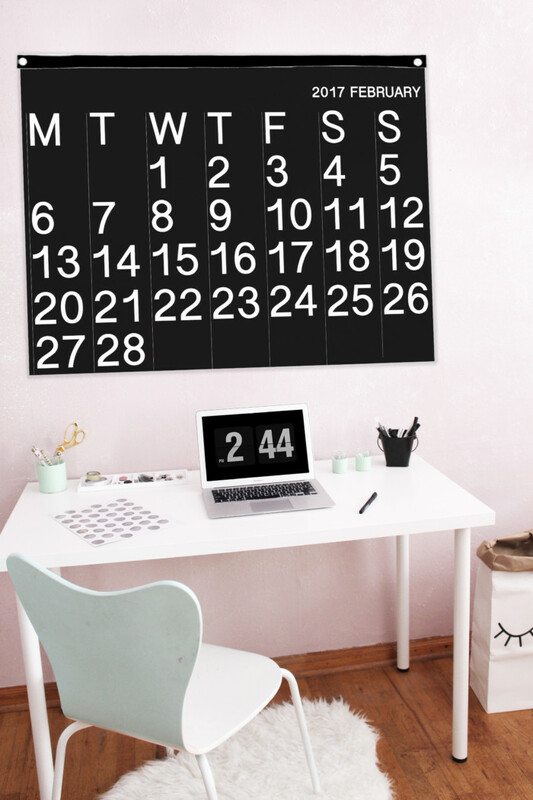 You could go one size up, 24″ x 36″ and spend about $44. Its also great if you don’t want to commit to the entire year, or you already missed a few months and don’t need the whole year. Or, if you’ve ever seen some of the fabulous things people do to recycle their Stendigs, you could simply print off a few pages just to have one of those projects (hello pretty gift wrapping!). So, theres plenty of reasons why this free, similar version is super useful, even if you already nabbed one of the real things. As with last year, I did a regular version (alternating black and white), an all white version, and an all black version. Just in case you prefer one over the other for your space! Grab the free printable below, check out this post for the how-to for putting it together, and let’s all collectively hope 2017 is better, and easier, than 2016 was. *One little note. These are in 24″ x 18″ size because that is much easier to work with. 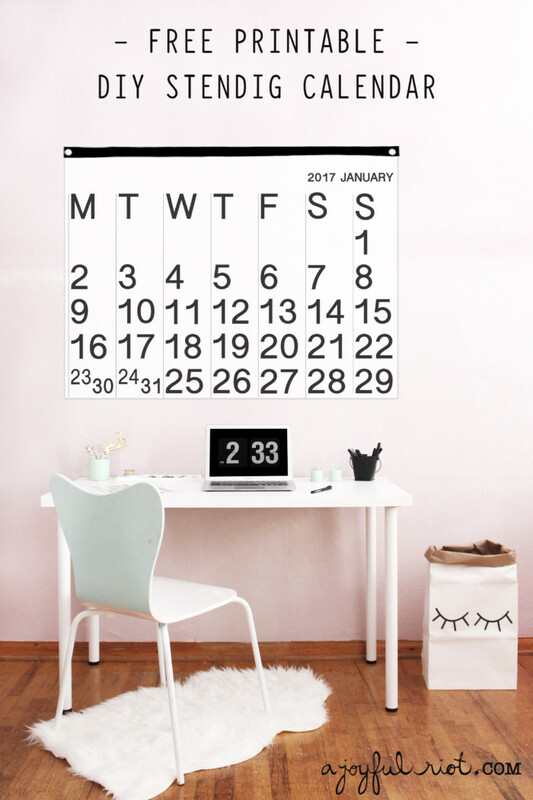 But, they are high resolution so you should have no problem ordering them in the full 36″ x 48″ size. Oh! And print them out via “engineering prints”, available at most copy centers. I get mine through Staples. Well hello! If you were wondering if we were still alive worry no longer! We are alive and well we just took a sort of unplanned and extended break from the blog. A few family things happened and work got crazy + vacation and holiday travel. Combined, all of this left both Machelle and I with less time to sit down and compose posts and the blog unfortunately fell by the wayside. With all that said we had a wonderful holiday and break. I was able to both travel over Thanksgiving to Bangkok, Myanmar and Seoul and then less than three weeks later head home to Utah to spend some much needed time with family. The trip was amazing and will try and share more photos soon but for now let me just say GO TO BAGAN, MYANMAR. DO IT NOW. Of course, that is only if you are able to do so – I know that travel is a huge luxury and one of the things I am most grateful for looking back on 2016 is that I have blessed great opportunities to travel. It is one of my passions and loves of life and I realize I am so blessed to be able to do it. 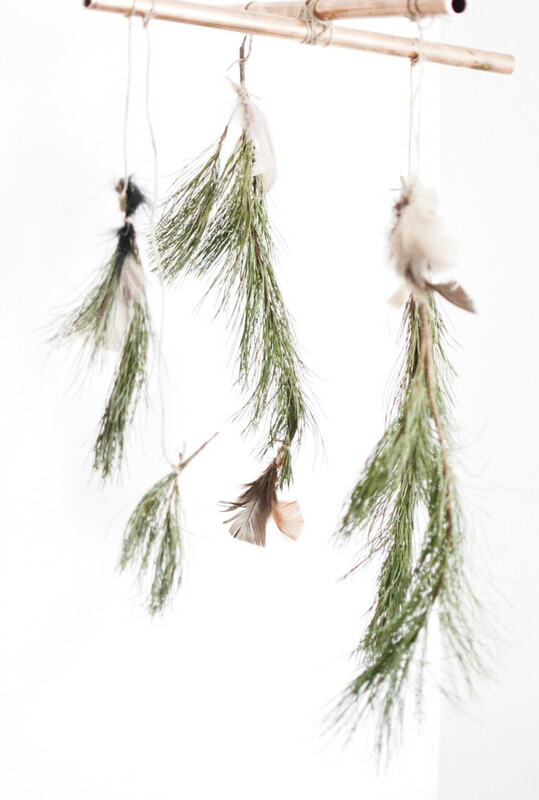 Now we want to do a post sort of wrapping up the past year but I had created this mobile before I left for Utah and wasn’t going to share it since we were past the holiday season. However, I came home and as I took down my decorations I was filled with immediate despair at the impending January and lack of holidays and decorations. And I decided that you in fact can keep some holiday decor up in the month. Especially if it is natural and non-specific to any holiday like this mobile. January is still filled with evergreens but no big event. 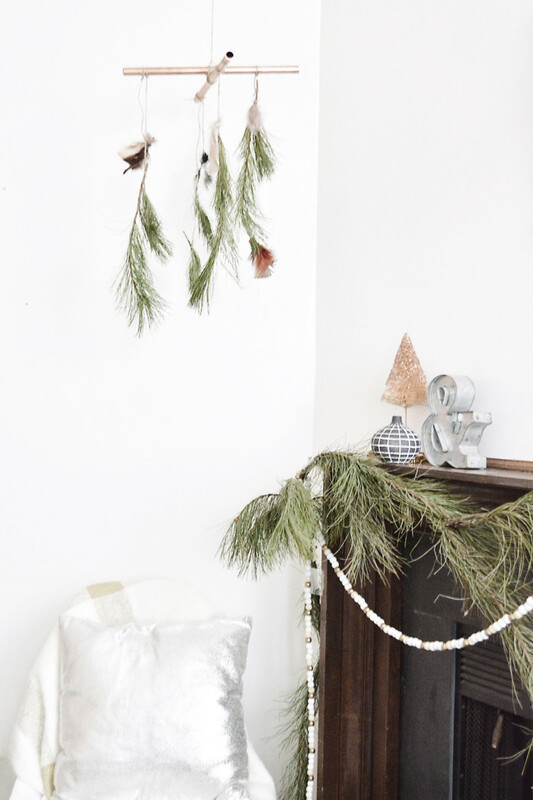 So let’s not deprive ourselves of low-key pine decorations! Plus, this project would also be a perfect backdrop to a dinner or party treat table anytime in the next two months. Read on for the quick tutorial!